You and Your Big Dreams: We Interrupt Your Regularly Scheduled Programming to Announce . . .
We Interrupt Your Regularly Scheduled Programming to Announce . . . I know it's Monday AND you're here for the CASEing Genius post but there isn't one today. I know you're probably disappointed but I have a really good reason. Ready?! What?! Yeah I almost didn't believe it either. No, really. Funny story. I'm still in the "No Way. Shut Up!" phase and so excited to be joining the rest of the talented team. Alright, since this post is not about me joining the team but is about the spectacular June Release why don't we get to that? Today I'm focusing on the new set Watercolor Anemones. This one is a stunner. There are so many ways to use it. Especially since there are builder elements in it. Quick easy shading or watercoloring or whatever you want. Here's the products I'll be using today. I literally stamped them in distress ink and added water. For just a bit of variation I dropped in some Dusty Concord to my Seedless Preserves and Peeled Paint into my Crushed Olive. I lightly splattered a bit of peeled paint and it was done. Easy Peasy. I'd love to do a card set like this as a gift. The sentiment is from the Flowers Doodles Dies in gold foil with a few gold sequins to finish it off. Easiest card ever. Next I decided to do something I haven't done in a long time . . .an embossed resist. 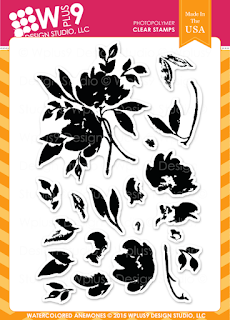 I stamped the bouquet stamp included in the set all over my watercolor panel and heat set it in white. Then I just added my peerless watercolors in various shades. I'm pretty much in love with it. I might ask it to marry me. Don't tell my husband. 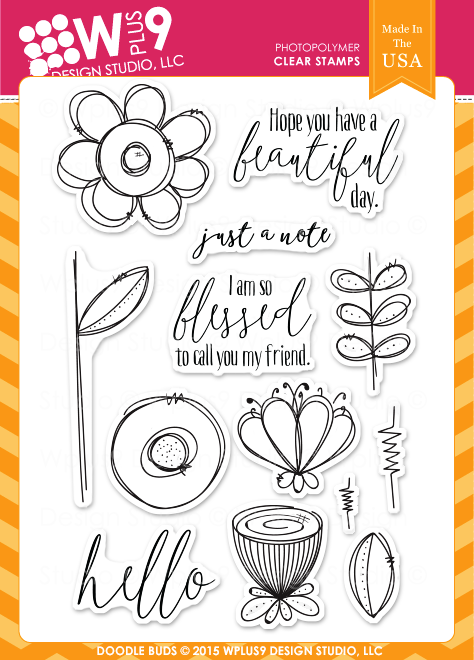 The sentiment is a combination of the Doodle Buds stamps and dies. 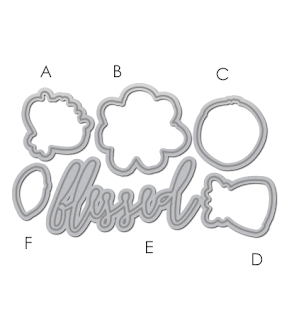 The "blessed" was die cut from black cardstock and added flush to the panel once it was dry. The stamped portion I was able to do with a little creative masking. As long as you use an Archival ink, like WPlus9's Pure Color line, you can stamp over embossing with no problem. Be careful though because it is a slick surface and smudges can happen really easily. Been there, done that. Okay that's it for me but there is plenty of more inspiration to be seen. 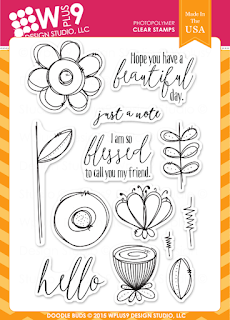 We'll be sharing all week long and the stamps will be available June 5th! Don't forget to go see Kara and Joni too. Those girls are bound to knock your socks off!! Wplus9 has chosen wisely! I'm so happy for you Kelly! .. was hopping this was the big news:) Your cards for today are stunning as usual:) Those Anemones are killing me!!! Congratulations Kelly, very very deserved. You are such a natural, you will totally highlight their products. They are very lucky to have you. incredibly gorgeous cards and awesome news!!! Big congrats, Kelly! I will love seeing your work over there!! Congrats, Kelly! Fabulous cards! I love the story and also, I REALLY do hope you will start doing videos! I would love to SEE/WATCH how you did these cards! Fabulous fabulous news Kelly :) Congratulations. Congrats on joining such a great team!!!! Love your cards! Two very lovely cards, they both are amazing! Congratulations on joining the WPlus 9 design team we look forward to seeing great things from you. Hahahaha! That should say "ear to ear" not ear to eat! Lol!! See? I was so excited for you, I couldn't type fast enough! Beautiful cards to go with another W+9 fantastic release. And congratulations on earning a spot on the design team. That's a wonderful accomplishment! Congratulations Kelly!! You're the perfect addition and your cards are fabulous! Wow, this is fabulous! They are lucky to have you! Congratulations!! You rock, as do these amazing cards!! Beautiful cards! Congratulations on joining this fabulous company's design team! KELLY!!!! I am so happy to have another chance to see you in action!!! Loud applause here!! And I'm over the top happy to see you use these gorgeous Anemones... on my list, for SURE!! Congrats! Congratulations, Kelly! This is such a amazing news! Dawn is happy to have you! You' re gonna be so amazing! Love both of your cards! Fantastic!! Love your watercoloring! Congrats on being on the DT! Congratulations, Kelly! I was so excited to see the announcement! I'm so happy for you! 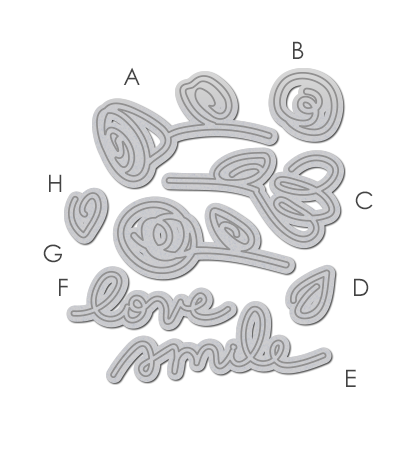 And I love what you made today, too -- you're a fabulous addition to their team! Cute story and a big congrats! Your work is beautiful, and I love these cards! Stunning! Congratulations and so very well deserved!!!!! Love your work! Congratulations , Kelly! Wow ...I can see why you were asked to be on the DT...Your cards are gorgeous! Adding my congrats to you, Kelly! What a well-deserved DT spot for you. Your gorgeous creations are THE reasons! Yay! Congratulations, Kelly! Your cards are absolutely stunning!! Welcome to W Plus 9 design team...wonderful example thanks for sharing. Looking forward to more! So happy for you Kelly! you deserve it so much! Love your new cards as always! Congratulations!! Your cards are stunning!!! LOVE the first one. Big Congratulations to you! [Your plate is getting really full of awesomeness huh? ;)] -- I see why the companies are after you - amazing, amazing samples you create - and yep, it makes me want to buy! Super congrats on the big news! What nice colored cards ! Congratulations on your design team!! I've been following your blog for a while and wondered why you weren't on any teams because your work is just amazing! These two cards are absolutely stunning!! Big congrats Kelly!! You are a really amazing!! Your two cards are so very beautiful! Congrats! What gorgeous cards...that second with the resist, WOW! Be still my heart, the COLORS! Congratulations Kelly!!! Your introduction with these cards are fabulous!! Love what you did with the color choices and modern design!! YIPEE!! CONGRATS to you, Kelly!!! I am so happy for you...and for Dawn in her choice of a new designer! Your cards are absolutely gorgeous, and I just know you're going to represent W Plus 9 in the most fabulous way...I can't wait to see more from you ~ Hugs! OMG your cards are amazing and that story was so funny! Congrats! Sooooooo well deserved!!!! Spectacular! Congrats; you are a MARVELOUS addition to the DT! Well, Kelly, CLEARLY you should be on the Design Team because your cards are absolutely AMAZING every time I visit your blog! Congratulations and AMAZING cards!!!! Love your watercolor work, something I want to try. The cards are stunning! CONGRATULATIONS to you - you will be SO AWESOME for this - and these 2 cards are gorgeous beyond belief and the colors just so vivid and fresh!! Way to go - so excited for you and this cool adventure! !